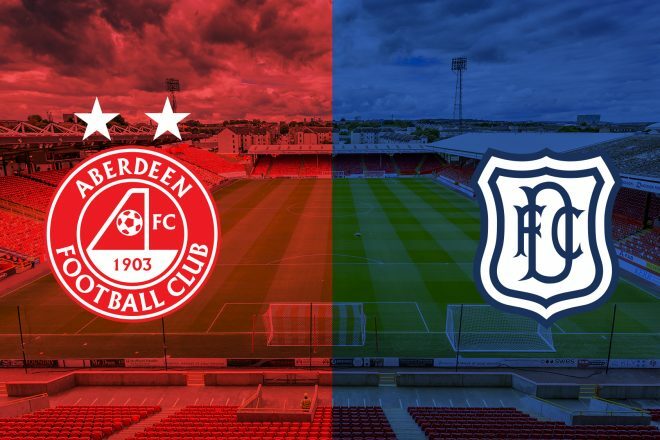 It’s the sixth of nine matches for The Dons this Tuesday as they take on Dundee at Pittodrie. Fresh off the victory in Paisley on Saturday, the hosts will be looking to make it three on the spin and go to a point of the summit of the Premiership, albeit for one night at least. For Dundee they suffered the setback of going down 3-1 to Kilmarnock at the weekend after finding some momentum with draws against Hibernian and Rangers in recent weeks. Jim McIntyre’s men will be searching for the points soon as they look to climb the table and get clear of the relegation fight. 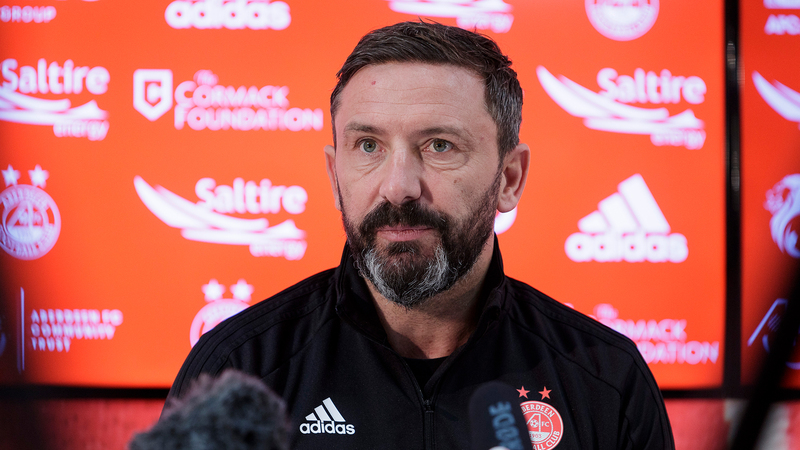 On Monday lunchtime Derek McInnes and Scott McKenna spoke with the media ahead of the match. “I think both lads (Stevie May and Sam Cosgrove) have always contributed. They are both hardworking boys, honest and both get us up the pitch in different ways. Sam with his size and taking it in with Stevie in behind and working the centre halves. Ultimately we’ve been searching for more goals from everyone and certainly as strikers the responsibility falls on them so it’s great to see Sam getting back to back goals and great to see Stevie getting his goal and being a constant threat. ““I wasn’t involved in the last match against Dundee, I was injured at the time, but of late they have been doing well and picked up points and Kenny Miller has started scoring goals for them. We know it will be a difficult game. It will be up to us to make sure we concentrate at the back and hopefully we can continue our good form. Dundee come into this one sitting in 11th place on nine points. It’s been a difficult few months for the dark blues with victories hard to come by and the new manager, Jim McIntyre will be looking for a reaction from the defeat at Rugby Park. They will be looking to Kenny Miller to provide an upturn in fortunes and the former Rangers player, who started the season as player/manager at Livingston has already come up with seven goals including a hatrick against Hamilton Accies a few weeks back. Of all the opponents The Dons have faced over the years there are fewer with a worse record when it comes to visiting Pittodrie. At home The Dons have racked up 59 wins in 106 league games, losing only 16 times and drawing on 31 occasions. You would have to go back to May 2004 for the last Dundee win at Pittodrie when future Don Steve Lovell compounded Aberdeen to a miserable end to a miserable campaign. Thankfully The Dons have been fairly comfortable against Dundee sides over the years and have won seven of the last ten at Pittodrie. Last season Stevie May scored a magnificent double on his home debut to earn a late victory and it was another close affair in March where it took a first half strike from Graeme Shinnie to claim the points. The biggest ever Aberdeen victory over Dundee at Pittodrie remains 6-1 as Benny Yorston’s hatrick stole the show back in season 1930/31. 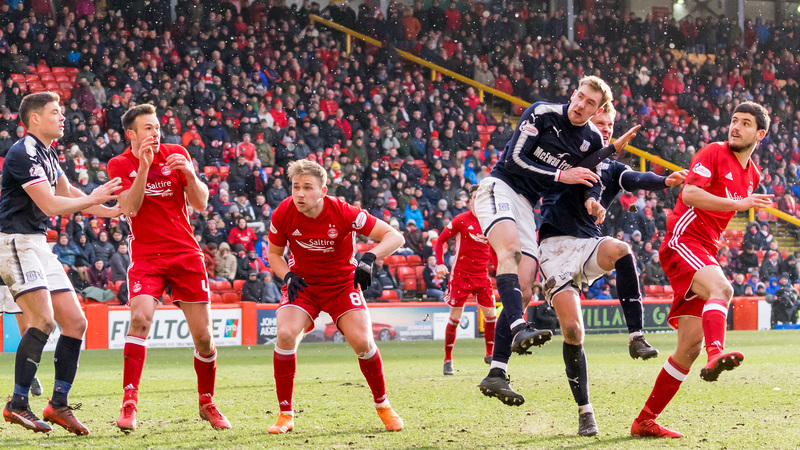 Overall The Dons have netted 186 times compared to Dundee’s 100. This week’s classic match comes from the league encounter from January 2015. The Dons went into the match on the back of an incredible winning run that included eight clean sheets on the spin. They got off to the perfect start when David Goodwillie netted after only seven minutes and The Dons were looking good early on. Unfortunately, the Aberdeen goal was breached in ten crazy minutes of football. Firstly, Gary Irvine became the first man in 758 minutes to score past Scott Brown and two minutes later Greg Stewart put the visitors into the lead at the break. Then Harkins made it 3-1 after half time and The Dons faced an uphill battle to get anything out of the match. The team waited until late late in the game as Lawrence Shankland went down in the box and the referee pointed to the spot. With no Adam Rooney on the pitch the responsibility fell to Jonny Hayes, who just about did enough to power home and give Aberdeen hope. Then in the dying embers of the match The Dons went on the attack again and Ryan Jack popped up at the back post to have the old stadium rocking as if they’d witnessed the win and not the point which it turned out to be to keep the unbeaten record intact. The fixtures keep coming for The Dons and the rest of the Scottish Premiership, with another round of midweek fixtures. 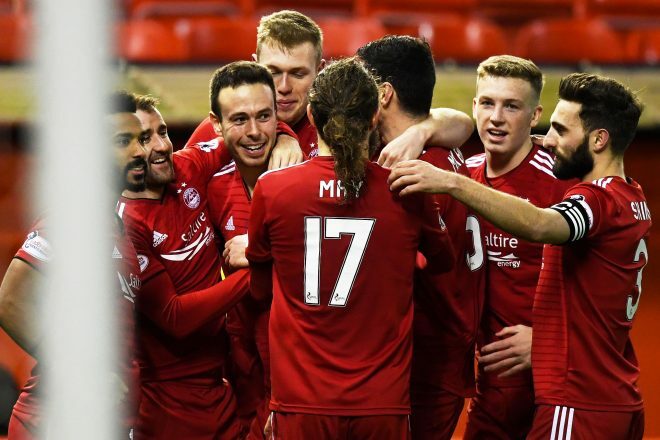 After Tuesday The Dons face an out of form Hearts side before the mouth-watering clash with Celtic on Boxing Day – nobody will want to miss that one. If you can’t make the game make sure to tune into our RedTV coverage. UK listeners will be able to tune in from 2.30 as Dave and Andrew preview the match with former captain Russell Anderson. International subscribers will be able to watch live and post-match we will have reaction, goal action, highlights and a full match replay. The Dons recorded their third consecutive win in the space of a week with an emphatic 5-1 victory over bottom of the table Dundee. 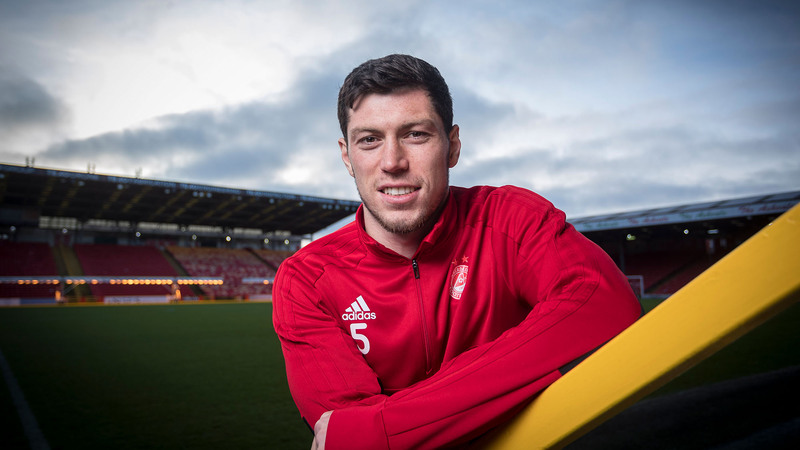 A first-half brace from Sam Cosgrove, a second-half brace from Andy Considine and a Connor McLennan strike took Aberdeen to within one point of league leaders Rangers and level with Celtic. McInnes named an unchanged starting XI from the side that overcame St Mirren 2-1 in Paisley at the weekend. The Dons welcomed visitors Dundee to Pittodrie for their third game in a week knowing that a victory would take them within one point of league leaders Rangers and level with Celtic. Dundee, on the other hand, came into the tie off the back of a 3-1 defeat to Kilmarnock, a game which ended their mini-revival after taking points off both Hibs and Rangers. The home side started the game well, winning an early corner after some good perseverance down the right from the skipper. Cosgrove got up well from the resulting set-piece and nodded onto May who had his effort hooked off the line by Kenny Miller who was back defending. Shinnie was getting on the ball frequently in the early stages and did well to win a free kick in a dangerous area 25 yards out from goal. Both May, Ferguson and McGinn all showed interest in it but it was the latter who struck and forced Dundee keeper Jack Hamilton into a routine save. A goal was coming and it eventually did on the fifteen-minute mark. It came from a Dundee corner, within a flash The Dons were up the other end and it was 4 on 2 with red shirts piling forward to join McLennan. The winger picked out May but after May’s shot was blocked the chance looked to have gone. But possession was well recycled and McLennan got a second chance to deliver and this time he put it on a plate for Sam Cosgrove who nodded home from close range to open the scoring. It was the third goal in as many games for the big striker. Cosgrove was clearly oozing with confidence and The Dons looked in the mood to add to their tally. After a good start, the home side were given a wake-up call after some good skill down the right-hand side allowed Jesse Curran to flash a dangerous ball across the Aberdeen penalty area. It just needed a touch from a blue shirt and the score would’ve been level but fortunately for The Dons there were no takers. The response was positive, with Shinnie forcing a smart stop Jack Hamilton moments later after a clever piece of skill. Crosses into the box from wide areas appeared to be the clearest threat – both Cosgrove and May looked menacing and ready to pounce on anything. Having been a virtual spectator all game, Joe Lewis was forced into making his first save after 40 minutes following a low drive from Nathan Ralph. Just before the break The Dons added a thoroughly deserved second goal, through Cosgrove. The 22-year-old was quickest onto to a ball over the top and had May and McGinn alongside him for company but clearly full of confidence the striker decided to go it alone blasting his shot through the legs of Hamilton at a relatively tight angle to give The Dons a 2-0 lead at the break. The Dons came out for the second half hoping to continue the momentum they gained from the first and five minutes in the home side had a third. More poor Dundee defending allowed Andy Considine to wander free into an acre of space and nod in McGinn’s out-swinging corner, putting the game beyond all doubt. Another five minutes later and three had become four. McGinn again caused havoc down the left-hand-side, combining with May before picking out the arriving McLennan. Running at pace the winger did well to compose himself and calmly slot home. With one eye clearly on the upcoming visits of Hearts and Celtic, McInnes began to ring the changes – the first of which saw Stevie May make way for Dom Ball just after the hour mark. The visitors did pull one back through Calvin Miller after an efficient move. Miller took the shot early and fired low past Lewis into the bottom corner, but it was far too little to late for the visitors. James Wilson came on to replace McGinn with twenty minutes left to play. The Dons were getting a lot of joy down the left-hand-side, McLennan won a corner after a delivery into the box which caused chaos and deflected out off a blue shirt for another corner. Shinnie’s delivery was met by Considine again who forced a brilliant point-blank save from Hamilton. The keeper parried up and into the danger area and Considine reacted quickest and made sure with his second attempt nodding home for his second and Aberdeen’s fifth on the night. Cosgrove received a standing ovation after he was replaced by Forrester with fifteen minutes left on the clock. The Dons showed no signs of letting up and continued to push for a sixth but it wasn’t to be and Andy Considine, unfortunately, couldn’t complete his hat-trick. It was a thoroughly pleasing night for The Dons who now go into the next two home games either side of Christmas just one-point off the top.